Freight rates for nine-tonne pay load section for select destinations dropped Rs 1,000 at the local truck transport market in the national capital today following comfortable position of trucks against restricted cargo movements. 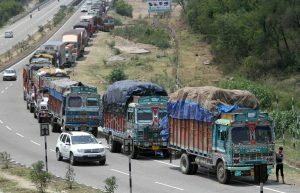 Transporters said, besides excess position of trucks in the market, tight cargo movements, mainly pulled down freight rates for select destinations. Delhi to Jaipur, Chandigarh and Gwalior freight rates moved down by Rs 1,000 each to Rs 13,000, Rs 14,000 and Rs 11,000, respectively. Rates to Kanpur, Ludhiana, Kochi and Baroda also went down to Rs 18,000, Rs 16,000, Rs 70,000 and Rs 21,000, respectively.